Looking for great easy dessert recipe that is perfect for blueberry ? Yes, It is a recipe for simple blueberry cheesecake made extra special with the addition of both fresh blueberries and blueberry sauce. This cheesecake recipe is much easier than many traditional cheesecake today, Let’s go !. Preheat the oven to 190˚c /375˚F /Gas Mark 5. Brush a 20-cm/8-inch spring from round cake tin with oil. Melt the butter in a saucepan over a low heat. Stir in the biscuits, then spread over the base of the prepared tin. Place the cream cheese, eggs , 100g of the sugar and ½ teaspoon of the vanilla extract in a food processor. Process until smooth. Pour over the biscuit base and smooth oven for 20 minutes until set, remove from the oven and leave for 20 minutes. Leave the oven switched on. Mix the soured cream with the remaining sugar and vanilla extract in a bowl, spoon over the cheesecake. Return it to the oven for 10 minutes, leave to cool. Then cover with cling film and chill in the refrigerator for 8 hours, or overnight. This part we are made the blueberry sauce for topping the cheesecake. To make the topping, place the sugar in a saucepan with 2 tablespoons of the water over a low heat and stir until the sugar has dissolved. Increase the heat, add the blueberries, cover and cook for a few minutes, or until they begin to soften. Remove from the heat. 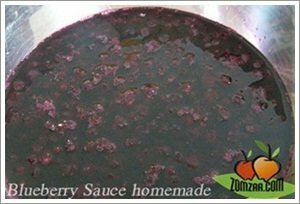 Mix the arrowroot and remaining water in a bowl, add to the blueberries and stir until smooth. Return to a low heat. Cook until the juice thickens and turns translucent. Remove the cheesecake from the tin 1 hour before serving. Spoon over the blueberry topping and chill until ready to serve delicious blueberry cheesecake. If you are looking for a delicious way to serve blueberries for dessert, follow this easy directions and you will be amazed how good this is. 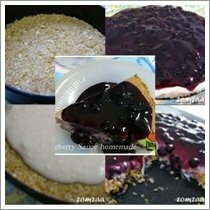 Enjoy this Blueberry Cheesecake; I hope you will give these delicious blueberry cheesecake a try :).